I'm growing Red Russian Kale and the butterflies and moths don't go for the kale as much as they do for cabbage and Brussels sprouts. But they're the worst on Cauliflower. I must not be planting the beets and chards right because their germination has been very spotty. They are all doing about the same Jal some a little better than others but not much. Apple I planted a bunch of chard seeds and the ones in my garden were very spotty with germination as well. Actually a lot of them sprouted and than soon thereafter died. Some did okay I have some virtual monsters in my front flower bed and some pretty good sized ones in my rose bed. But I had to buy some at the store for my veggie garden and they are dong great. 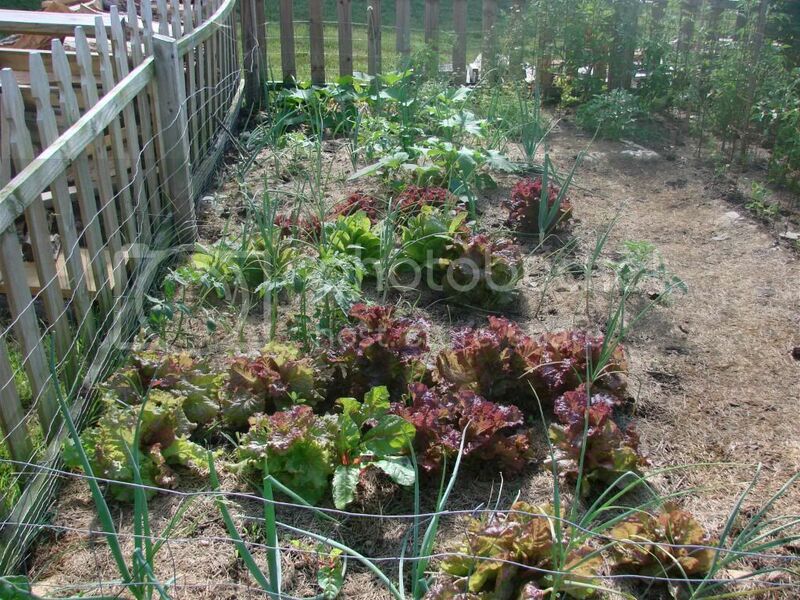 Here is my lettuce bed as of about a week ago it is a jungle in there now with all the lettuce and curcubit volunteers. Can you find the 10 or so volunteer tomatoes that survived the mass thinning I did earlier of the hundreds that sprouted. Looking at the pic I cut off another row of big lettuce in the foreground. Now that's quite a bit of salad since they are almost all getting ready to or in the process of bolting. I have noticed that the bugs seem to like the early cabbage above all else in my garden. They don't like the red cabbage at all. The bugs are not bothering the kale either right now. Nothing is bothering the lettuce either this year. Usually earwigs and slugs have a go at it. OK on the Oak Leaf Lettuce. I have not tried that one. Gix, nice lettuce patch. Its going to be hard to eat all that. I bought some mixed color chard seed, then forgot to plant it. I may plant some now. I think it will grow. That is strange. I have good luck with these things sprouting. They always come up thick because each little pod has several seed in it. Try planting them about an inch deep and firm the soil after planting. Put a seed every 2 inches in the row. You will still need to thin. I don't know what your temps are like there this time of year, but I have had good luck planting beets even in warm weather. You could try a few more if you have a space. 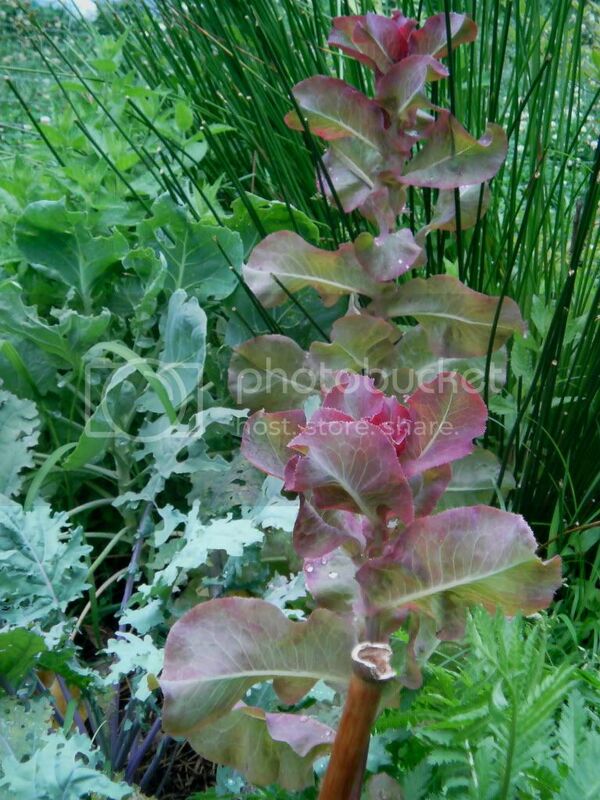 Chard and beets are the same species, just different varieties. Last edited by jal_ut on Sun Jun 20, 2010 12:55 pm, edited 1 time in total. Ah, I might be planting them too shallow. Planting them now in the heat*, they'll especially need the extra coverage. I'll try that (AND FIRM WELL -- I remember ). Thank you. *Went down to mid-50s last night, but forecast for the next week is high 80's/mid 60's. That is what I'm talking about that is a lot of lettuce. I have been eating the heck out of it too. I planted some "rainbow/5 color silverbeet but am not getting the rainbow effect. I have a bunch of seed and will plant some more after the lettuce is gone. I would think you will have no problem getting chard to grow now you are much cooler than I am (you too Apple) and mine is doing great to almost uncontrollable. And the the compliment has me blushing coming from you. I have seen your harvest. They are nothing to look down at in any way. Apple I am a fan of the "firm well" philosophy as well. Most don't agree but that is what I always have done for whatever reason. I hear onions especially like it firm because it gives them some resistance to grow against. If I remember right. Though I'm still struggling with onions to a certain extent, this year might be different, I hope. Maybe I'm in the wrong climate for onions, yeah that's it, wrong climate. Wondering off topic to the onions, I am slowing coming to the conclusion that I might never manage to grow the full-sized onions from seed by the end of the first season, so the way to go might be a two-year plan: Sow closely with intention of achieving the dime-size or less ONION SETS. In other words, don't bother sowing seeds ultra early indoors like January or February, simply sow outside with peas or a week or so after peas and proceed. The trick then is to make sure the sets don't get too big because larger sets will grow scapes and will only be good for green onions. The question then is would I be able to store these tiny oniions, harvested sometime... say... in fall, until spring when onion sets are planted?